In the meantime, I’m still seeking out some good recipes and some good tricks to recreate the flavors of Mexican cuisine in my own kitchen. This weekend I made this shredded chicken taco dish again, an easy adaptation for a Guangzhou kitchen. Looking through a huge list of recently bookmarked Cinco de Mayo themed recipes, I re-discovered the website Muy Bueno Cookbook along with this recipe for a mango salad, reminiscent of the chile sprinkled mango and jicama sold from carts on the street corners in downtown LA. Rather than a chunky salad, I preferred to scale it down to a salsa, and with magoes and cucumbers both sold prolifically at the wet market, it was a no-brainer. The recipe called for plenty of chile powder in the salad, but I wanted a more nuanced spice in this salsa, and so also grabbed from the piles of mild peppers at the market. She also showed me other important skills, one being how to wield a knife. My mother could (and still can) pulverize garlic into the tiniest minced flecks, slice ginger into the thinnest slivers, and artfully cut carrots and firm tofu into perfectly-square little cubes. The Chinese believe that the proportion of shapes and sizes of a dishes’ components play a big part in the flavor and taste of a dish. Hence, the Chinese have an extensive vocabulary for the prep work of different cuts of meat and vegetables- significantly more than their Western friends. Whenever I’m prepping a dish like this salsa, spending much longer than anyone typically would to make sure the shallots are appropriately, I compare them to how my mom used to do it. When people make salsa and their tomatoes are cut into huge, uneven chunks, the onions are in unappetizingly large pieces, and the cilantro is not even chopped, I am a little uneasy. Maybe you’d say I was spoiled- I’d say I was taught well. 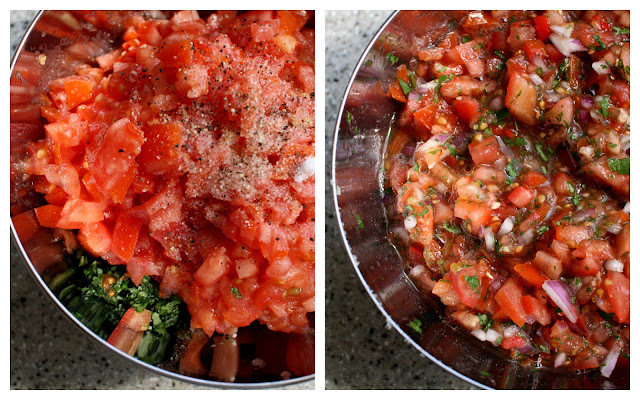 In any case, I’d consider this a secret to a good salsa, or a salad, or any freshly chopped mixed vegetable dish. Peel and cut mangoes into a small dice. The easiest way to do this, I’ve found, is to: cut the stem-end of the mango off so you can easily and securely set the mango on its end on a cutting board. Using a sharp knife, slice the peel off, downwards, along the length of the mango. Keep turning and trimming the peel off until your mango is “naked”. Then carefully cut the meat off the pit in the largest slices possible, and dice from there. Combine shallots, celery, red and green peppers with lime and salt to taste. Mix well, allowing the shallots to macerate in the lime juice to lessen its sharpness. Combine mango and cucumbers, and toss to mix thoroughly. Cover and let sit in the refrigerator for at least 20-30 minutes. Can be prepared a day ahead, if necessary, but shouldn’t be kept more than a couple of days- which probably won’t be a problem! Yield: approx. 3 1/2 cups of salsa, or enough to feed 10-12 people for a taco dinner!